The Amundsen Sea currently has some very large polynya. In front of the Dotson, Getz and Pine Island ice shelves they are clear in the satellite data. The sea ice extent along the Antarctic Peninsula 9 October 2016. Data from DMSP SSMI. 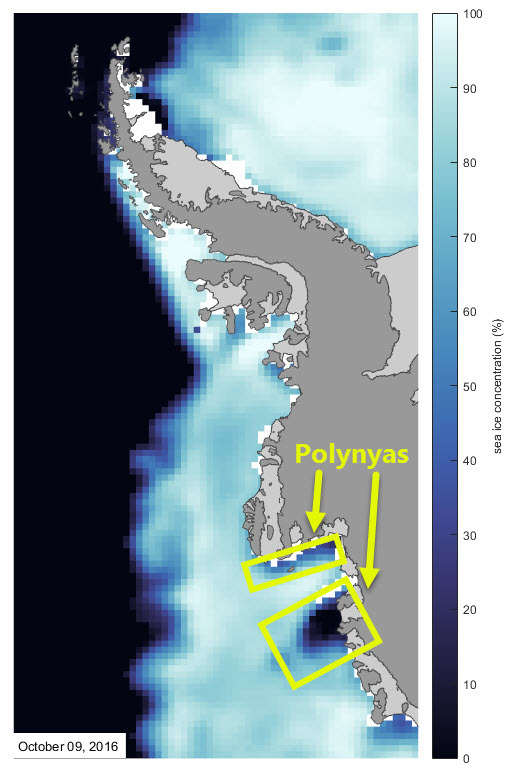 A polynya is an area of open water in the winter pack ice. These are likely latent heat polynya, and strong winds are pushing the sea ice away from the coasts to make the open water. In the open water there will be a lot of sea ice generation. I wouldn't be surprised if the weather that is keeping the sea ice compressed against the Antarctic Peninsula is also responsible for opening them. Taking the MODIS data from the TERRA satellite and importing that into google earth, the open water shows up as black. At the top of the image in front of Pine Island Glacier the polynya are partially obscured by cloud. In Google Earth you can measure the area quite easily. Posted in Science. Tags: Amundsen Sea, antarctica, Dotson Ice Shelf, google earth, Kohler Glacier, polynya, satellite, sensible heat loss, Smith Glacier on October 11, 2016 by Mark Brandon. 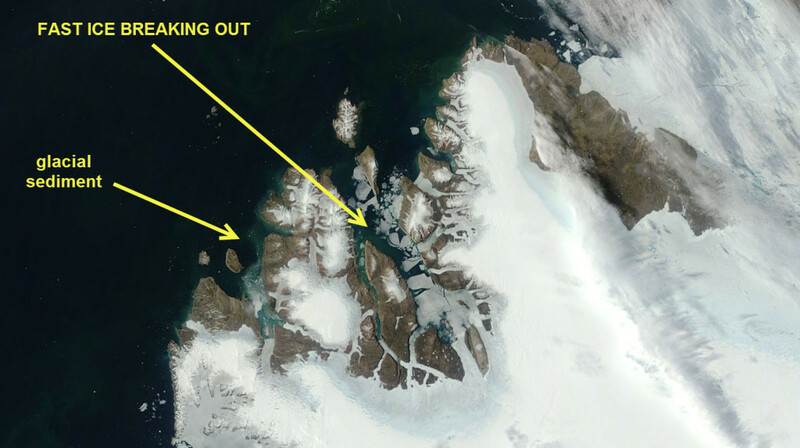 There is a lot happening at the edge of the Greenland Ice Sheet as summer progresses, and the MODIS sensor on the TERRA and AQUA satellites is a wonderful way to observe it. The full image can get down to 250 m per pixel and it is amazing stuff. The image below (from Google Earth) shows the location. And now in the 9 July MODIS image you can see very many large pools of water on the edge of the Greenland Ice sheet. Again, remember each pixel of this image is 250 m across - they look small but that are large pools. Posted in Science. 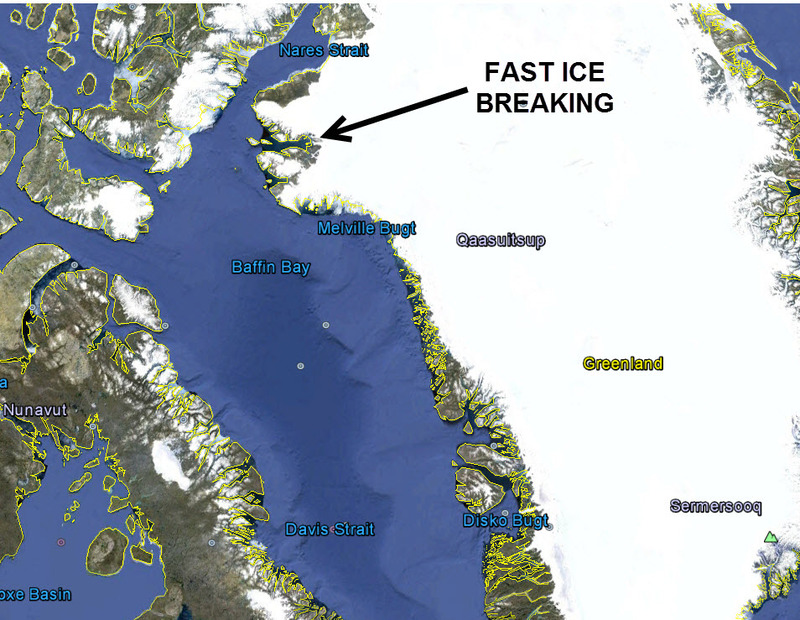 Tags: fast ice, fjord, google earth, Greenland, lake, melt, MODIS on July 10, 2015 by Mark Brandon.